November 24, 2013. (Romereports.com) The Year of Faith came to a close with a Papal Mass in St. Peter's Square. Thousands came out to the Vatican to celebrate, as the Pope highlighted that Christians should always have Christ at the center of their lives. The Pope thanked Benedict XVI, who launched the initiative, as well as the 250 patriarchs, bishops and priests who took part in the closing Mass. Reflecting on Sunday's Gospel, the Pope said Jesus speaks of forgiveness and not condemnation. In fact, during the Mass, 50 priests were available to administer Confession along the Square. He explained that just like Jesus forgave the thief who was crucified next to Him, He forgives all sinners. He also asked everyone to say a special prayer. The relics of St. Peter were placed right next to the altar, marking the first time they've been displayed publicly. They include eight bone fragments of about three centimeters each. At the end of his homily, Pope Francis held the relics as he prayed. (Vatican Radio) Pope Francis delivered the homily at Mass on Sunday to mark the Solemnity of Christ the King and close the Year of Faith proclaimed by his predecessor, emeritus Pope Benedict XVI. Below, please find the official English translation of Pope Francis' prepared remarks. 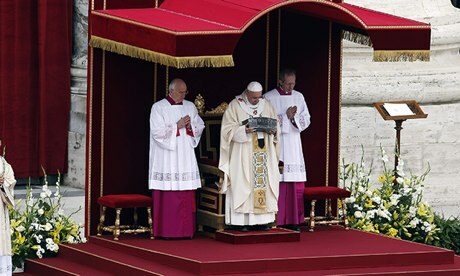 (Vatican Radio) Pope Francis celebrated Mass and prayed the Angelus on Sunday, to mark the Solemnity of Christ the King and the close of the Year of Faith, proclaimed by Pope emeritus Benedict XVI in the last year of his reign. Thousands of pilgrims braved the late November chill in the morning air to gather for the Mass in St Peter’s Square under an overcast, threatening sky. A highlight of the celebration was the presentation, at the end of the Mass, of the Apostolic Exhortation, Evangelii gaudium – The Joy of the Gospel – to a select group of faithful representing each state of life in the Church, and a broad array of vocations, including a bishop, a priest, a deacon, religious men and women, novices, a family, catechists, artists, journalists, young people, the elderly and the sick. The Exhortation is the concluding document of last year’s Assembly of the Synod of Bishops, which focused on ‘The New Evangelization for the Transmission of the Christian Faith’. The official presentation of the document is scheduled for this coming Tuesday, November 26th. (Vatican Radio) Christians are called to trust in the Lord, even in the most extreme situations. These were the words of Pope Francis at Mass on Monday morning in the Vatican’s Casa Santa Marta. Pope Francis focused his homily on those characters from the daily readings who testify to the importance of trusting in God, even in extreme situations. In the Book of Daniel, the young Jewish men living as slaves of King Nebuchadnezzar remain faithful to the Lord, even at risk of their own lives. In the Gospel of Luke, the impoverished widow who puts two small coins into the offering box is praised by Jesus, who says: “Those others have all made offerings from their surplus wealth, but she, from her poverty, has offered her whole livelihood”. The Lord, Pope Francis says, is everything, and they trusted in the Lord. They didn’t do so because of some fanatical force, but because they knew that the Lord is faithful. They trusted in that faith which is always there, the Pope said, because the Lord cannot be unfaithful, cannot deny Himself. "You Ask Him to Remember You, And He Brings You Into His Kingdom"
Citing security concerns without naming a specific threat, the U.S. State Department is planning to shutter its embassy to the Holy See inside the lush Villa Domiziana overlooking the Circus Maximus and Palatine Hill in central Rome. The embassy, which has been in operation since 1984 when Ronald Reagan and Pope John Paul II signed an accord, will essentially be swallowed up by the larger, more influential U.S. embassy to Italy. Italy is unique in that many countries have two embassies in the capital city – one to the country of Italy and the other to the Holy See, a sovereign nation within the city of Rome. Some, like the United States, even have a third embassy to the United Nations Organizations headquartered in the city. The embassies create a diplomatic subculture that has spawned a slew of international schools and services from health care facilities to commissary-style international food stores, all catering to the large foreign community. After the move to the American embassy to Italy, scheduled for January 2015 when remodeling work is expected to be completed, the embassy to the Holy See will inhabit a small annex with a separate entrance, but it will be far less independent than it is in its current position across town. Not unlike having two popes in Vatican City with both Pope Francis and Emeritus Pope Benedict XVI, having two ambassadors in one embassy compound will undoubtedly lessen the power prestige of one. Russian President Vladimir Putin is welcomed by Pope Francis as he arrives for a private audience at the Vatican on Monday. 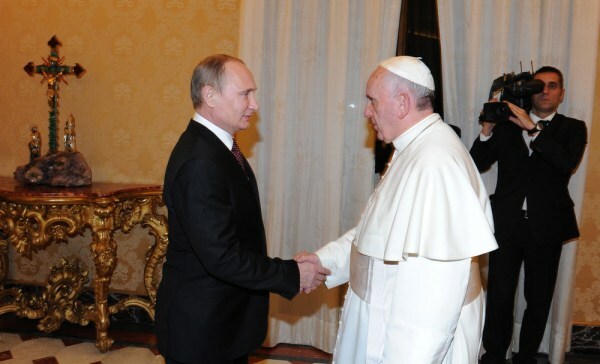 ROME — Pope Francis and Russian President Vladimir Putin met Monday amid high expectations that their visit could mark the beginning of the end of the centuries-old rift between the Roman Catholic and Eastern Orthodox churches. Since becoming pontiff in March, Francis has met with more than a dozen heads of state, and Putin met with both of his predecessors Pope Benedict XVI and Pope John Paul II. But this meeting comes at a unique time. "And [Francis] therefore has a more independent approach on international issues such as the relations between Orthodox and Catholics. Being from Argentina, (Francis) is not tied to the old idea of Western Christianity, so this could play in [Putin’s] favor,” Tornielli added. Francis has ushered in a period of reform at the Vatican, but the timing is right for a thawing of relations between the Eastern and Westerns Churches for other reasons, too: full diplomatic ties between Russia and the Holy See were only re-established in 2009. But despite numerous visits by Russian leaders to the Vatican, the head of the Rome Catholic Church has never been allowed to repay the favor and travel to Moscow. (Vatican Radio) Pope Francis on Tuesday reminded the faithful that man may think he is the master of the moment, but only Christ is the master of time. Speaking to those present for the morning Mass in Casa Sanctae Marthae, the Pope said prayer and hope are the tools that come to our aid in every moment of our lives. In prayer and with hope we are able to understand and accept the passing of time and to prepare for its end. Prayer – Pope Francis explained – along with discernment helps us to decipher single moments of our lives and guides us towards God. Hope – he said - is the long-range beacon that illuminates our path and that final moment. Reflecting on the Reading of the Day in which Jesus explains what will happen before the end of humanity and tells those who believe in God not to despair, Pope Francis said God has two reccomendations for us. He said a Christian is a person who knows how to live the moment and who knows how to live in his or her time. The moment – he added - is what we have in hand right now, but this is not time, the moment passes! Perhaps we feel we are the masters of the moment, but to believe that we are masters of time is a deception, because – Francis said – “time is not ours, time belongs to God! (Vatican Radio) Pope Francis has issued his first Apostolic Exhortation on Tuesday, Evangelii Gaudium, translated into English as The Joy of the Gospel. The 224-page document outlines the Pope’s vision for a missionary Church, whose “doors should always be open”. The Pope speaks on numerous themes, including evangelization, peace, homiletics, social justice, the family, respect for creation, faith and politics, ecumenism, interreligious dialogue, and the role of women and of the laity in the Church. (Vatican Radio) During his general audience in a cold St Peter’s Square today, Pope Francis continued his series of reflections on the Creed, explaining how our Christian faith sheds light on the mystery of death and brings us the hope of Resurrection. Without faith, the Pope said, death can seem scandalous, especially when children suffer and die. But as we know when we lose a close friend or family member, our human hearts rebel against this false vision and we yearn for the infinite, the eternal, the knowledge that life does not end with death. In the final battle between God and evil that we read in the liturgy in these days, there’s a trap which Pope Francis calls “universal temptation.” It’s the temptation to give in to the deceitful ways of those against God. But those with true faith can look to Jesus for the strength to withstand the insidiousness of evil. Jesus, who endured insults and lies in his public life and the trials of evil in the desert, bore them to his death on the Cross. But, as Prince of Peace, Jesus triumphed over the prince of the world through the Resurrection. In his homily, Pope Francis pointed to these events in Christ’s life because, he said, as we hear the Gospel recount the tumultuous time of the end of the world, we become aware that the victory of the prince of the world over God would be more disasterous than a devastating natural disaster. Today, the Pope observed, people are discouraged from speaking of religion in public. “It’s (considered) something private, no?” It’s something you don’t talk about in public, he said, pointing to the fact that religious objects have become tabu’. “One has to obey the orders that come from worldly powers. One can do many things, nice things, but not adore God. It’s forbidden to worship. This is at the heart of the “end of times.” It is when this pagan attitude reaches its height, that’s when the end times will come, the Pope stressed. This is when the Son of man will return in glory. Speaking to the participants of the plenary assembly of the Pontifical Council for Interreligious Dialogue, Pope Francis underlined the importance of friendship and respect between men and women of different religious traditions. He noted that due to increasing movement of peoples because of phenomena such as migration, Christians are being challenged to be more open to different cultures, religions and traditions. Quoting from his recently published Apostolic Exhortation Evangelii gaudium, the Pope said "an attitude of openness in truth and love must prevail in dialogue with believers of non-Christian religions, despite the various obstacles and difficulties, particularly fundamentalism on both sides "
Recognizing the fact that there are situations in the world where coexistence is difficult due to fear, the Holy Father underlined that the one way to overcome this fear, was to foster dialogue. VATICAN CITY -- When he was archbishop of Buenos Aires, Pope Francis was known to sneak out at night and break bread with the homeless, sit with them literally on the street and eat with them, as part of his aim to share the plight of the poor and let them know someone cared. That's not so easy to do now that he's pope. But Francis is still providing one-on-one doses of emergency assistance to the poor, sick and aged through a trusted archbishop. Konrad Krajewski is the Vatican Almoner, a centuries-old job of handing out alms -- and Francis has ramped up the job to make it a hands-on extension of his own personal charity. "The Holy Father told me at the beginning: 'You can sell your desk. You don't need it. You need to get out of the Vatican. Don't wait for people to come ringing. You need to go out and look for the poor,"' Krajewski said. Krajewski's office funds its work by producing papal parchments, hand-made certificates with a photo of the pope that the faithful can buy for a particular occasion -- say a wedding, baptism or priestly ordination -- with the name of the recipient and an apostolic blessing written in calligraphy. (Vatican Radio)The Christian conforms his way of thinking to God’s, and for this reason rejects ways of thinking that are weak and restricted. This was the central theme of Pope Francis’ homily during Mass on Friday morning in the Casa Sanctae Martha. The Lord taught his disciples to be attentive to the signs of the times, signs which the Pharisees failed to comprehend. Pope Francis today met with 120 leaders of men's religious orders taking part in an assembly of the Union of Superiors General, the main international umbrella group for men's communities. At the moment, the group’s president is Spanish Fr. Adolfo Nicolas, the leader of the Jesuit order to which Francis also belongs. The meeting with the pope, which took place in the Vatican’s Synod Hall, spanned three hours and occasioned some of Francis’ most developed thoughts on religious life to date. Francis also said that formation in religious orders is “a work of art, not a police operation.” He said that while we’re all sinners, religious orders should not tolerate corruption: “We accept sinners, but not the corrupt,” he said. Upon leaving the hall, Francis also thanked the religious for their "testimony" and for “the humiliations you have to endure." Though he didn't specify what he had in mind, Francis is clearly aware of the sometimes troubled relationship some religious communities, including his own Jesuit order, have had with the Vatican in recent decades. The following is the text of statement on the meeting released today by the Vatican Press Office, in an NCR translation from the Italian. VATICAN CITY (CNS) -- When the Synod of Bishops on the new evangelization met at the Vatican in October 2012, among the top items on the agenda was the threat of militant secularism in a post-Christian West. "It is as if a tsunami of secular influence has swept across the cultural landscape, taking with it such societal markers as marriage, family, the concept of the common good and objective right and wrong," and posing new impediments to spreading the Gospel, Cardinal Donald W. Wuerl of Washington, the synod's relator, told the gathering at its first working session. The same topic arose repeatedly in addresses by synod fathers, especially those from Europe and North America, and in the final propositions they gave the pope as the basis for his post-synodal apostolic exhortation. But Pope Benedict XVI resigned before he could write such a document, leaving the task to his successor, who finally responded with "Evangelii Gaudium" ("The Joy of the Gospel"), published Nov. 26. In writing the apostolic exhortation, Pope Francis departed from usual practice and declined to use the draft provided by synod officials. The result is a text in the pope's distinctive voice and focused on his particular concerns. Among the features that distinguish "Evangelii Gaudium" from the synod that gave rise to it, none is more striking than how little attention it pays to the problem of secularism. (Vatican Radio) Pope Francis on Saturday received a group of Greek Melkite Catholic pilgrims who are here in Rome. The Pope told the pilgrims that his thoughts are with the suffering in Syria, and that his prayers are with those who have lost their lives and their loved ones. Writing for the first time as Pope to mark this feast, Pope Francis assures the Patriarch of his intention to pursue fraternal relations between the Church of Rome and the Ecumenical Patriarchate, saying that it is for him a source of great reassurance to reflect on the depth and the authenticity of our existing bonds, the fruit of a grace-filled journey along which the Lord has guided the Churches at Rome and at Constantinople since the historic encounter in Jerusalem between Pope Paul VI and Patriarch Athenagoras, the fiftieth anniversary of which we will celebrate shortly.